FRANKFURT, Germany -- Of the many auto mechanical devices -- mostly cold and heavy metal -- ever invented in human history, perhaps nothing has made people's hearts beat more than cars. Millions around the world go wild watching various flavors of motorsports competitions from Formula One to World Rally Championship, which tests both human limits and the high-performance capabilities of the cars. Marking a meteoric rise, Hyundai Motor’s racing team has been sweeping up championship titles in recent years, less than five years since it made a world debut in 2013. Currently ranked second in World Rally Championship, the racing arm of the South Korean auto giant aims to take the throne this year, a chance to prove its passion and confidence in high-functioning cars to the world. The team Hyundai is competing in Wales Rally GB, the 10th WCR rounds this year, which ends Sunday, local time. 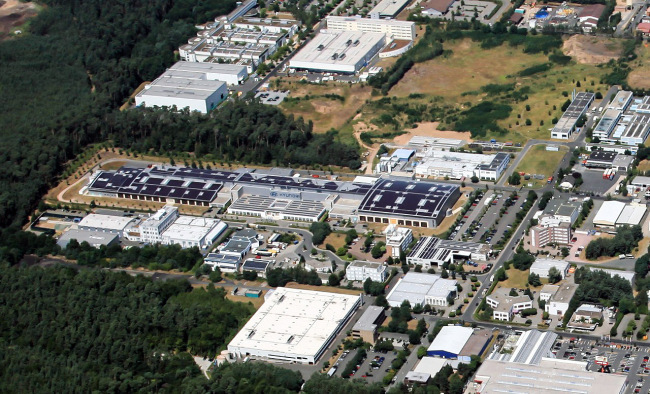 Behind the drive is Hyundai Motorsport, the racing division of Hyundai Motor, headquartered in Alzenau, 27 kilometers east of German financial hub Frankfurt. Around 200 engineers from 30 countries have joined forces in the 16,000-square meter complex to achieve the goal of manufacturing a dream car that goes faster than any other even in extreme road conditions. 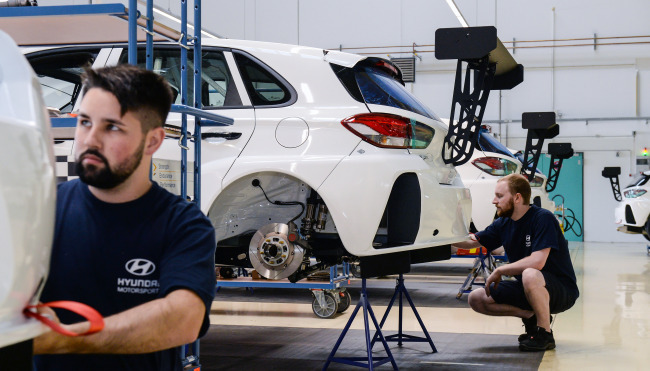 Competing with cars manufactured by other auto giants including Toyota, Citroen and Ford, Hyundai has deployed its i20 assembled in a manufacturing plant in Turkey and modified the compact car into a supercharged racing machine. They compete in the 13 rounds of World Rally Championships held on 13 occasions in Europe, Australia, Argentina and Mexico. Each round, drivers are thrown into a full range of road conditions from icy to muddy terrain for 1,000 kilometers over three days in a single event. Hyundai taking a part in rallies is to test the car’s capabilities and go beyond its limit. “So why WRC? It’s the best brand-fitting competition,” said Stefan Henrich, head of marketing and public relations of Hyundai Motorsport, during a press tour of its head office in Alzenau. For instance, a vehicle with a turbo engine easily get overloaded at high altitudes because of less oxygen for full combustion. Testing such cars in extreme environments provides refreshing ideas for Hyundai vehicles to evolve, he said. A racer poses between the i30 N TCR (left) and i20 Coupe WRC. For WRC competition, Hyundai has turned i20s to racing cars that produce 380 horsepower and 450 newton meters of torque, reaching 100 kilometers per hour in just four seconds. Engine modification is the key that takes two years to develop and costs billions of dollars, said Hwang In-koo, an engineer at Hyundai Motorsport. Compared to mass-produced engines, engines for racing competitions are 100 times more expensive. Each costs around 200 million won ($177,000) for custom-made production. The team can have three engines for each vehicle participating in rallies, or nine for a season, which requires engineers to put together engines that can go more than 4,000 kilometers. Carmakers are obliged to comply with WRC rules that limit the cost and functionality of the engines. Hence there’s no big difference in engine power, but to win, other elements play a crucial part. “In order to make good scores, we need to have performances of drivers, power and engine come together at their best,” Hwang said. 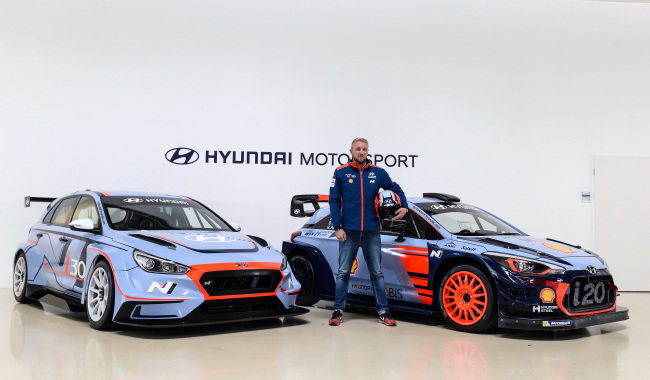 Riding the popularity of the Hyundai Motorsport team, the division has been producing cars for customer racing -- a kind of racing competition where car manufacturers provide ready-to-race cars to professional drivers competing in the World Touring Car Cup and R5. R5 rally cars are priced at around 228,000 euros ($263,000) while a regular circuit racing car for WTCR costs about 128,000 euros, lower than the International Automobile Federation’s price ceiling of 150,000 euros. And Hyundai’s racing cars are finding no shortage of buyers. “We sold cars for 40 WTCR competitors, but can’t sell more with orders from around piling up and we can’t produce more than one unit a week,” he said. “The high demand of Hyundai racing cars reflects the growing popularity of Hyundai Motorsport team. It shows how people see Hyundai cars differently,” he said.